In the thin, dry air at the South Pole, there is no water vapor to absorb microwave radiation, making it possible for the telescope to detect the Cosmic Microwave Background. Courtesy of John Ruhl. John Ruhl, a professor in the Department of Physics, is used to traveling to the ends of the Earth to track down light from the dawn of the universe. His route from Cleveland is a long one: first to the International Antarctic Center in Christchurch, New Zealand, via commercial airline, then down to Antarctica itself in the belly of an LC-130 military transport aircraft that lands on skis specially designed for the ice. In an age of quick international travel, getting to the South Pole is an uncomfortable journey that lasts several days; it is only done November through February, during the Antarctic summer. What makes the trip worthwhile to cosmologists like Ruhl is that Antarctica has conditions unlike those anywhere else on Earth to observe the Cosmic Microwave Background (CMB). The CMB is a radiation relic left over from the early universe, just a few hundred thousand years after the Big Bang. Back then, the universe was a very different place than it is now. For one thing, it was much smaller, and all of the matter in it was packed into a hot, dense soup of particles. As the universe expanded and cooled, protons and electrons “recombined” to form the first atoms. Among these atoms were photons that created the CMB—photons that have traveled through space ever since. By studying this radiation, scientists are gaining a fuller understanding of the early universe, from its shape to its rate of expansion, and gathering clues about the universe’s ultimate fate. Even though the entire universe is glowing with CMB light, it can be difficult to detect; water vapor in the atmosphere normally absorbs this radiation at the frequencies where it can be measured. Enter Antarctica. The driest continent on Earth, it gets so little precipitation that it is classified as a frozen desert. The South Pole is doubly good for CMB observations because of its extreme elevation. Nearly two miles high, it is situated above much of the water vapor in the atmosphere. And because sunrise and sunset occur only once a year at the South Pole—during the summer and fall equinoxes—the atmosphere is more stable than in most other places on Earth; it doesn’t warm and cool on a daily basis. Ruhl has been a co-principal investigator on a series of CMB experiments in Antarctica and has visited the continent several times since his first trip in 1988. But none of these experiments has been quite like the South Pole Telescope. Ten meters (nearly 33 feet) in diameter, the telescope, located at the Amundsen-Scott South Pole Station, is designed to detect the CMB radiation at millimeter wavelengths—longer than waves of infrared light, but shorter than radio waves. The project involves dozens of collaborators from around the world, including investigators from several major research universities and government laboratories. John Ruhl and members of his CMB Cosmology Group have developed radiation detectors for the South Pole Telescope. They test them in the blue device, a cryostat, whose interior can be cooled to nearly absolute zero using liquid nitrogen and liquid helium. In order to sense photons from the CMB, the detectors must be kept many orders of magnitude colder than Antarctica itself. For this reason, the telescope is equipped with cryostats, too. 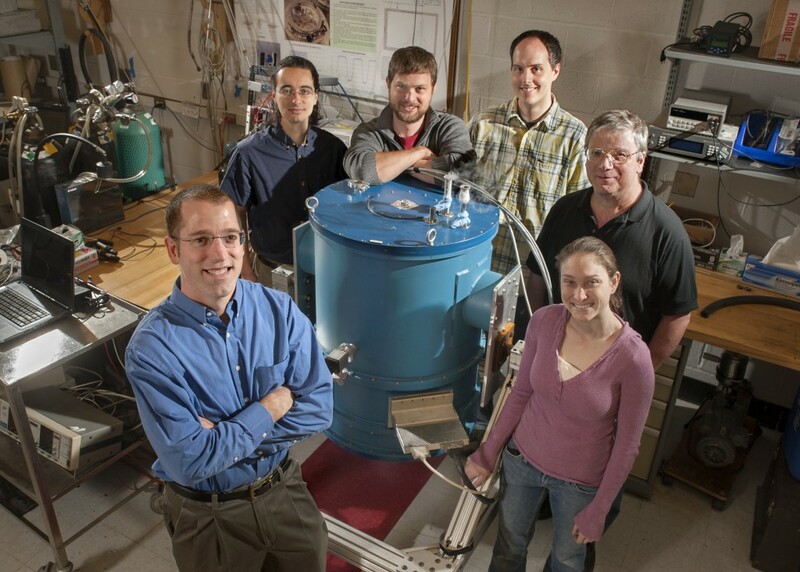 Clockwise from front: Ruhl, doctoral students Ben Saliwanchik, J. T. Sayre and Sean Bryan, mechanical designer Rick Bihary, and doctoral student Johanna Nagy. Photo by Mike Sands. What makes the South Pole Telescope a unique instrument is that it studies not only the CMB itself but also its interactions with large galaxy clusters on its way to Earth. Galaxy clusters, made up of hundreds or even thousands of galaxies gravitationally bound together, are found in high-density regions of the universe. As the CMB radiation passes through them, some of its photons interact with the hot, ionized gas in the clusters, which can boost the photons’ energy to yield a slightly shorter wavelength. By filtering out these shorter wavelengths and looking only at the longer ones, the research team has been able to observe little “holes” in the CMB where clusters absorbed the photons passing through them. When examined with a traditional optical telescope, these “holes” indicate the presence of galaxy clusters previously unknown to scientists. As a result, the telescope has discovered catalogs of new galaxy clusters on an unprecedented scale. Working with collaborators in optical astronomy, the research team is seeking to determine the distances from Earth to these newly discovered clusters. They hope that their findings will yield a better understanding of the universe’s expansion over time. During its initial survey, the telescope also found a previously unknown type of galaxy, known as a dusty star-forming galaxy. “They are very rare, so people doing smaller surveys didn’t notice them,” Ruhl explains. “It’s the combination of a large telescope and a large sky survey that allowed them to be seen.” This surprising discovery has provided new insights into the evolution of galaxy clusters..
After such success with the initial survey, Ruhl and physics graduate student J. T. Sayre traveled to Antarctica in late 2011. 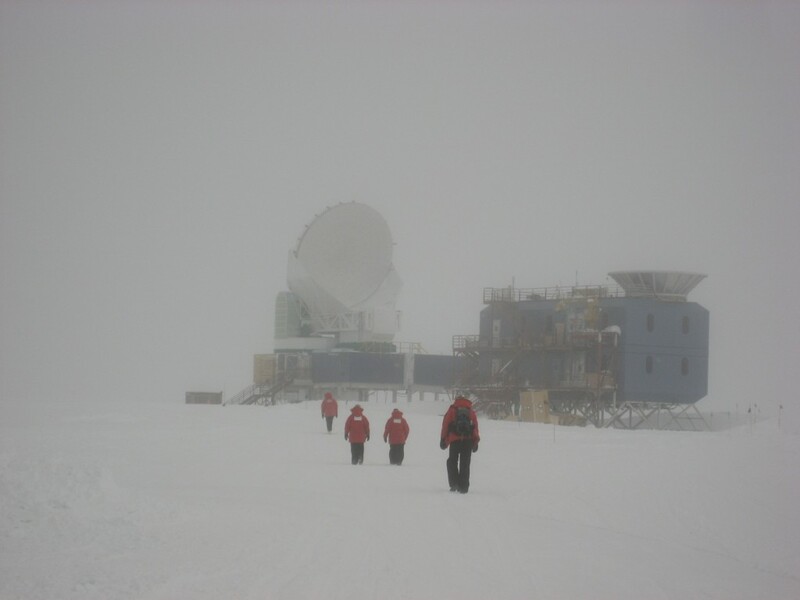 Working in wind chills near –70 degrees Fahrenheit, they prepared the telescope for the installation of a new receiver that was sensitive to polarization. The receiver was designed and built in part by members of Ruhl’s lab, including doctoral student Benjamin Saliwanchik and former postdoctoral researcher Tom Montroy. Here’s why the polarization-sensitive receiver was important. In general, the photons in the CMB radiation are only rarely scattered by the matter they encounter along the way. But the photons that pass through (or close to) the galaxy clusters are scattered—and this scattering creates polarization in the CMB, much as the scattering of light in the Earth’s atmosphere causes the sky to be polarized (and blue). The first polarization patterns detected in the CMB, called E-mode, were found back in 2002. The new polarization-sensitive receiver was built to look for a different pattern, called B-mode. This second pattern occurs, in part, because when photons carrying the E-mode pattern pass by large cosmic structures such as galaxy clusters, their paths are bent by gravity. This modifies the polarization pattern on the sky, changing some of the E-mode into B-mode. Studying this process can teach us about the formation of large-scale structure in the universe and all of the phenomena that affect that process. With its new receiver. 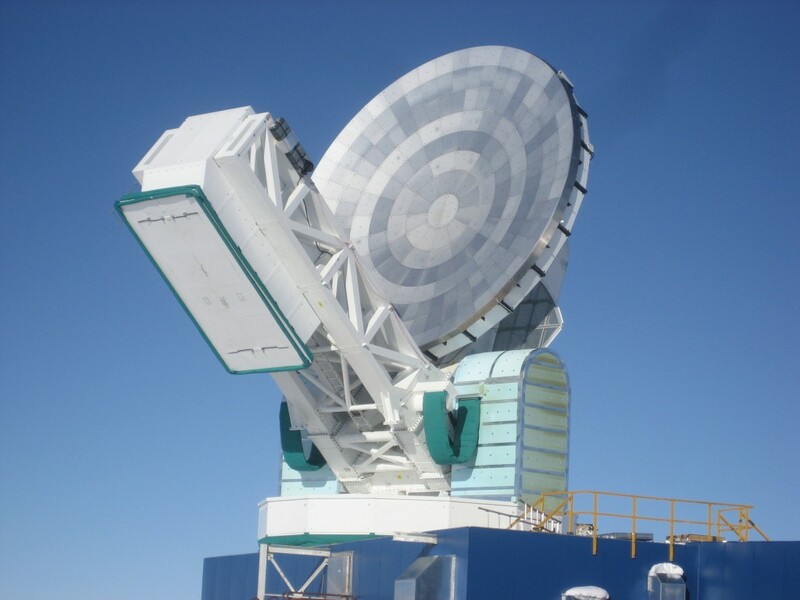 the South Pole Telescope succeeded in detecting B-mode polarization—a discovery heralded as one of the Top Ten Physics Breakthroughs of 2013 by Physics World magazine. The result also paved the way for other scientists, who in March 2014 reported detecting another source of B-mode polarization in the CMB—a signature of the rapid inflation of the early universe. “We are all looking forward to precise measurements of this to learn more about cosmology,” Ruhl says. The Antarctic sky is not always bright and clear. On stormy days, it’s a challenging trek from the Amundsen-Scott South Pole Station to the telescope a mile away. Courtesy of John Ruhl. For the next phase of their research, the scientists plan to redesign the telescope’s optics and make it more powerful so that they can study the B-mode polarization in even greater detail than before. “Besides gravity-wave signatures from inflation, we hope to measure the sum of neutrino masses,” Ruhl says. Neutrinos are fundamental subatomic particles that are everywhere but do not interact electromagnetically; though trillions of them pass through your body every second, you never notice. Neutrinos have a very tiny amount of mass, but no one knows how much; physicists expect that this information could be gleaned from the B-mode polarization in the CMB. Meanwhile, Ruhl’s lab is gearing up for another Antarctic expedition this winter with the launch of Spider, a balloon-borne telescope designed to observe the CMB B-mode polarization on longer angular scales than those observed by the South Pole Telescope. Spider was built in collaboration with scientists at Princeton University, Caltech, NASA’S Jet Propulsion Laboratory, the University of Toronto, the University of British Columbia, the National Institute of Standards and Technology, and Cardiff University. It was shipped to Antarctica last year, but the project’s start date was delayed a season because of the 2013 U.S. government shutdown. Ruhl and his team are eager to see what secrets of the early universe Spider will reveal.